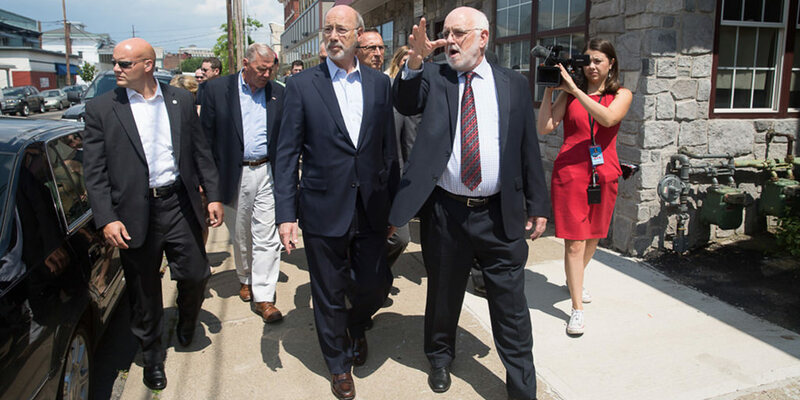 Scranton, PA – Governor Tom Wolf today toured the redevelopment on Cedar Avenue in Scranton to see how the partnerships between his administration, United Neighborhood Centers of Northeastern Pennsylvania (UNC) and local officials and organizations are revitalizing the neighborhood. UNC is leading the project to rebuild several city blocks in South Scranton by creating a mix of new homes for working families and businesses. UNC began leading the community-wide effort in 2008 to transform the neighborhood with new housing, retail and office spaces to reduce blight, improved community partnerships, decrease crime, and bring the community together. More than $20 million has been invested in the project. UNC and local officials to designate the neighborhood as an Elm Street Community, investing more than $2.8 million in the project. The Department of Education invests approximately $120,000 a year through the Education for a Family Learning program. “The tremendous beautification and revitalization efforts that have taken place through the Cedar Avenue project, with United Neighborhood Center, have brought about hope for what could be a broader revitalization of the South Scranton neighborhoods and have revitalized the community,” said Scranton Mayor Bill Courtright. In 2010, the United Neighborhood Community Development Corporation developed 40 housing units in the 500 and 600 blocks of Cedar Avenue including townhouses and apartments with commercial space on the street level and living space on the upper floors. The initiative was funded by $1,790,625 of Neighborhood Stabilization Program funds and $25,000 in Neighborhood Assistance Program tax credits from the Department of Community and Economic Development, $75,000 of HRA funds, $$187,500 of HOME funds, $75,000 of CDBG funds, $94,227 of CHDO funds, $225,000 of Local Share funds, and a $300,000 grant from the Weinberg foundation. The second phase of the project transformed multiple properties on Cedar Avenue and Alder Street into 30 apartments over nine buildings. The phase was supported with $420,000 in Local Share, $500,000 from Lackawanna/Susquehanna Behavioral Health, $878,880 from the Weinberg foundation and $7,170,910 from Low Income Housing Tax Credit Equity. To put a capstone on the decade long revitalization, UNC is in the process of completing the transformation of the former South Scranton Bank and Trust building with $150,000 through the Neighborhood Partnership Program from DCED and pending investments. The anchor for the neighborhood will provide space for the community, businesses and UNC services. The United Neighborhood Center is a nonprofit agency dedicated to meeting the needs of local low-income families, seniors, and youth, while also empowering them to attain self-sufficiency. The organization uses a wrap-around approach to address the emerging needs of the community in six departments including community services, child care, youth, older adults, community education and revitalization, and community health and a Housing/Community Development Corporation.